Architectural Commercial Shadecloth is primarily designed for use on Shade Sails and Tension Structures in both domestic, residential and commercial applications. It is equally suited for use on pergolas, privacy screens, exterior blinds, ground covers, sandpit covers, pool leaf covers and caravan annex awnings. Allpro Plus 95 is a superior quality grade shadecloth suitable for architectural, commercial or around the home use. 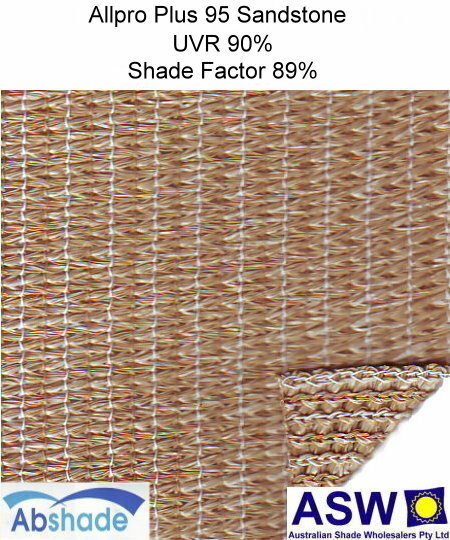 With a 95% shade factor and at 235 grams per square meter it is heavy-duty and hardwearing enough to be used for tough and long lasting applications such as tent floors, sea anchors or nets. Allpro Plus 95 can be tensioned, so you can use it to build shade sails, or tensioned shade structures around your home or business. You can’t go wrong with Allpro Plus 95; it has been heat set so it lays flat when rolled out (for ease of use) as well as creating a superior looking end product. Heat Set stentoring process which is an extra step during the manufacture process designed to reduce fabric shrinkage and make the fabric more stable and easy to work with.